Welcome to Day #4 of the 21 Day Fix Sneak Peek Group! One of the more difficult parts of starting any new diet or nutrition program is figuring out portion control. The color-coded 21 Day Fix containers were created to help solve this problem and make portion control simple and easy and get you away from the hassle of calorie counting. If it fits in the container and it’s on the approved food list, you can eat it! The purple container is for fruits. Berries can easily fit into this container as can grapes and cherries, but you’ll want to cut larger fruits like watermelon, or fruits with pits, like peaches. The official 21DF approved food list will tell you, for example, that 1/2 banana or one medium apple equals one purple container, so you do not constantly have to cut these up to put them into the container. The red container is for protein. Fill it with chicken breast, yogurt, eggs, tofu, or shellfish. For some of the other proteins, consult the food list in your guide. The yellow container is for carbs and starches. This is where you’ll fit in foods like rice, beans, sweet potatoes, and whole-grain pasta into your diet. For foods that don’t easily fit into your container such as waffles and tortillas, the portion amounts are listed in your 21 Day Fix guide. The orange container is for seeds and dressings. It is the smallest and is used for calorie-dense foods like seeds, olives, coconut, and 21 Day Fix-approved salad dressings. Now that you know what goes in the containers, it’s time to understand how to use them! Although you don’t have to count your calories each day, you will need to perform the simple calculation found on page 4 of your 21DF Nutrition Guide to determine your calorie range. Your calorie range will determine your container allotment for each day (ie 0 how many of each container that you get each day). As convenient and transportable as the containers are, you don’t have to eat out of them. You can measure out the portions in the containers and then empty the container out onto a plate or into a bowl. The example below of the salad is a good example of this concept. You don’t have to count calories. You only count containers. And it’s a lot easier to keep track of three green containers versus x number of calories!! It’s practical. Portion control is about moderation and being aware of what you’re eating.... the containers help you do this. After you’ve completed your first 21 days, you’ll have a good idea of how many fruits, vegetables, lean proteins, and healthy fats you should be eating every day. It’s definitely enough food. Often when people begin this program, they find that they’re full even before they’ve finished all their container portions for the day. That’s because healthy food has more volume than junk food! If you find that this is the case for you, only eat what you can, but make sure that you eat a little from all of the containers instead of just filling up on your favorite kind and avoiding what you like the least. But, you should really try to eat all of your containers each day as best as you can. Your container allotment has been calculated to fit YOU and Autumn Calabrese knew what she was doing when she decided how many containers you get to have each day. She gives you just the right amount of food to fuel your properly and keep your metabolism running at full force to effectively melt the fat away. If you do not eat enough food, you will stall your metabolism! So my advice.... Listen to what Autumn says and follow the plan! I really liked using the 21 Day Fix Tracker App on my phone to keep track of my containers (pictured to the right). The 21 Day Fix Tracker App is free on iPhone and $0.99 for Android. 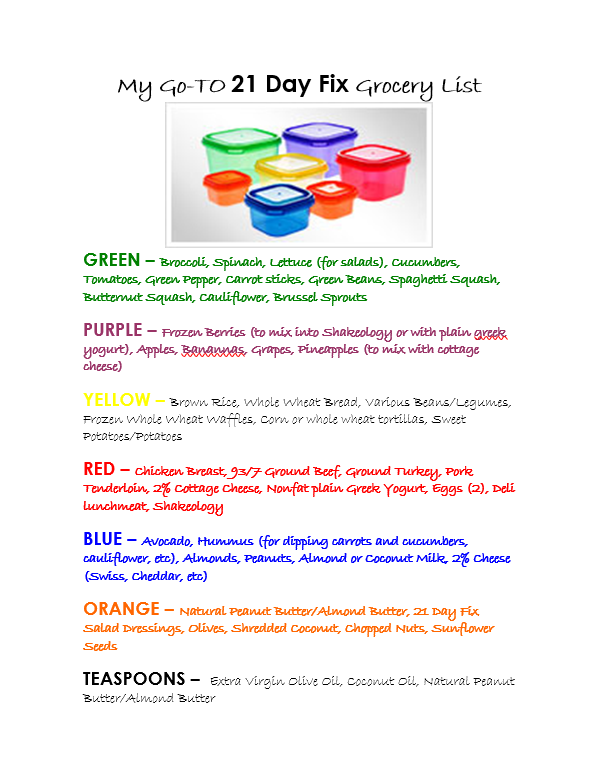 When I first began 21 Day Fix, I really found this tool helpful to keep track of my containers. However, I have found that I do not need to utilize this anymore. Over time, it becomes a habit. You are so familiar with how much of each food group that you are allotted each day, that you really do not need to think about it.. it is just second nature. I recommend that you begin by choosing 4-5 foods from each container grouping listed on the 21 Day Fix Approved food list that appeal to you. This will form the bones of your grocery list with which to get started. As an example, I have given you my "go-to" grocery list. This can be a great starting point for you. You just need to choose foods from the lists that suit your taste buds... everyone is different! That being said, I urge you to try new foods. Before I started this program, I had never eaten or cooked butternut squash, acorn squash, or spaghetti squash! And now all three of those are some of my absolute favorite foods and have become staples in my diet! Click the above link to get a printable version of my Go-To Grocery list. You need to have a plan when you hit the grocery store to stock up on all of your healthy food for the week! If you do not have a plan and you end up aimlessly wandering up and down the aisles.... you will surely end up with "naughty" foods in your grocery cart! Don't be that person! The best way to avoid processed foods and choose healthy whole foods is shop the periphery of the store! Bring your grocery list and STICK TO IT!! Get organized by planning and writing down all of your meals in ADVANCE! Then form your grocery list based on the meals that you have planned out. If you are like me, then you get sick of eating the same thing over and over again! That is what I have LOVED so much about this program! I enjoy cooking and trying new recipes and eating fun, flavorful, DIFFERENT meals often! There are so many recipes that fit into this nutrition plan! You can go on Pinterest and type in "21 Day Fix" and you will be absolutely amazed by all of the recipes that will pop up. There are literally thousands of recipes to choose from! I encourage you to surf Pinterest yourself and pick out some amazing recipes to try when you are planning your grocery list and your meals. Don't be afraid to cook your new found healthy meals for the entire family! I have prepared tons of "kid tested" and "husband approved" 21 Day Fix recipes that the whole family has loved! This is definitely one perk of the program which made it so easy for me to incorporate this as a lifestyle change rather than just another diet. The fact that I could change it up as often as I like and still enjoy the fun of experimenting with new recipes.... all without "cheating"! It's a win-win! If you are a little more old-school and would prefer a recipe book, I include an e-book of family friendly 21 Day Fix approved recipes with your purchase of 21 Day Fix as a special and exclusive bonus gift. I include pictures of each recipe as well as the container count per serving. The container count makes it super simple for you to incorporate the meal into your daily container allotment. Additionally, Autumn has put together a fantastic recipe book entitled Fixate which contains over 100 Fix Approved recipes (all with container counts listed). This is a great resource and I highly recommend this add-on if you enjoy cooking. Follow me on Pinterest! I have created several 21 Day Fix boards that you can use to get started! How do I go about planning my meals? I have never done anything like this before! I can assure you that this is not as hard as it may seem to you right now! You probably feel a bit overwhelmed... I did too when I first started the 21 Day Fix program. I recommend that you use this meal planning tally sheet when you are first starting out. It is a good idea to write down all of your meals and get organized, checking off your containers as you plan. No, you will not have to do this forever! (I promise) But, when you are first starting out, this really helps you to have a plan and to stick to it! After a while, this process really becomes second nature as you form the habit! I have a few strategies to help you get started as well as save you some time! 1. Start with the Protein - Protein will be your biggest challenge. Most of you will need to incorporate protein into every meal and snack depending on what calorie range with which you fall. I am allotted 4 red protein containers per day, so for me... this means that I eat three meals per day and one snack (and they all need to have protein). If you are allotted 5 red containers, then you would need to eat 3 meals per day and 2 snacks (all containing protein). So, I recommend that you grab your meal planning tally sheet and start by figuring out what your protein will be for each meal. For example, if you drink Shakeology in the morning, then you know that will be your red container at breakfast. If you are going to have a salad with 2 hard boiled eggs on it for lunch, then the eggs will be your red container for lunch. If you are having grilled chicken breast for dinner, then the chicken is your red container for dinner. Now, you need one snack... how about some Greek yogurt mixed with fruit? Ok, the yogurt is your red container at snack time. That is 4 red containers for the day! Now that the hard part is done, you can fill in the fruit (purple) and veggie (green) containers throughout the rest of your meals. I have given you a list of some easy and convenient sources of protein that are great when you are on the go. Get it here! 2. Plan your Blue and Orange Containers for each day - No matter what calorie range you fall into, you are only allotted one blue container and one orange container per day. This means that you will need to plan in advance what healthy fats you want to eat for that day.... ie - do you want to have cheese on top of your salad at lunch or hummus with carrot sticks as a snack later? Do you want to have avocado with your tacos at dinner or peanut butter in your Shakeology for breakfast? You need to think and plan in advance and weigh your options. For simplicity, I used the blue and orange containers interchangeably... meaning I might have a smaller portion of cheese (orange container) and a larger portion of avocado (blue container) in the same day. Then, of course I still had my allotment of teaspoons....so, on the same day that I am having the blue container of avocado and the orange container of cheese, I might also have a teaspoon of peanut butter (in my Shakeology) and a teaspoon of extra virgin olive oil (mixed with vinegar on top of a salad). So, this is how you plan your healthy fat allotment. I always like to save at least one blue or orange container and a teaspoon for dinner! 3. Don't be afraid to use Leftovers - Leftovers have absolutely been critical to my success! I enjoy cooking and I cook almost nightly for my family. When I am cleaning up after dinner each evening, I go ahead and measure out any leftovers into my containers and pack them in a lunch container to take to work for the next day. Simple! I have killed two birds with one stone here as I already have my lunch and maybe even a snack ready to go for the next day. So, when I am planning my meals for the week, I always plan and take into consideration using leftovers. This is such a convenient, easy, and most importantly healthy strategy for those of you with a busy lifestyle! 4. Use Carb Substitutes - Two of my favorite meals are spaghetti squash with meat sauce and turkey burgers with butternut squash fries (get this recipe here). We have spaghetti at least once a week at my house because my kids love spaghetti - who doesn't? Sometimes I eat it with whole wheat noodles, but oftentimes I prepare a spaghetti squash for myself (noodles for the rest of the fam) and make a big pot of sauce (93/7 ground beef). The squash and leftover sauce will last me for the rest of the week. We like to grill out on the weekends too! So, I make four turkey patties for myself with one pound of meat and have my husband grill those for me with the rest of the patties for my family (leftovers again). Then, I make butternut squash french fries for me and regular baked frozen french fries for everyone else. (several of the kids actually prefer my fries!) I never feel deprived and I trick myself into thinking that I am eating carbs when I am not! Win Win! Both spaghetti squash and butternut squash count as a vegetable on the 21 Day Fix meal plan! Use these sample meal plans that I have created and provided as a guide to get you started. Again, you need to choose foods that you enjoy and plan meals that fit your style! This is just intended to be a good starting point for you. Meal Prepping and Planning Strategies for Busy Moms On the Go! I am a very busy mom with six kids and a full-time job, so believe me, I feel your pain! I know what you are thinking.... "I do not have time to do a whole bunch of meal prep and planning!" Let me just ease your mind right there.... I don't either! This was one of my biggest hurdles when I began this plan, but I have developed several no fail strategies that I can incorporate into my busy lifestyle! Because I do a lot of cooking throughout the week and utilize leftovers during the week, I do not have a tremendous amount of meal prep to perform at the begining of each week. My meals are pretty much taken care of because I drink Shakeology in the mornings, eat leftovers for lunch at work, and I cook a healthy dinner for myself and the family at night. This really only leaves snacks as the major thing that I need to prep for at the beginning of each week. This is important, especially if snacking is huge stumbling block for you, like it is for me! You need to arm yourself with healthy snacks so that you will not make an unhealthy choice out of convenience! I already shared some of my favorite snack recipes to prepare in bulk to be ready for the week. Go back to Day #3 to see snack recipes. I have shared some of my favorite recipe ideas for cooking in bulk on Sundays to munch on throughout the week for an easy meal that is already prepared and ready to go. I will post a link to each recipe below. Get your week off to a good start by having a plan! Spaghetti Squash with Meat Sauce - Get the recipe here! Sweet Potato Crust Pizza - Get the recipe here! Cauliflower Crust Pizza - Get the recipe here! Roasted Chicken and Butternut Squash Soup - Get the recipe here! Preparation: Mix all ingredients together and enjoy on a bed of spinach, in a whole wheat wrap or even as romaine lettuce wraps. The best part is that it will feed you for multiple meals during the week! Make sure you eat a balanced snack or meal prior to venturing out to the grocery store. This is critically important if you are stopping to shop following work. Pack extra snacks, bring them to work and eat them toward the end of your day or on your way to the store. If you find yourself at the store and you are hungry but did not prepare a snack, go to the pre-cut veggies and grab something healthy like cut cucumbers. You can also ask for a sample of sliced turkey when you are at the deli or order a few slices. This will fill you up with smart choices, so you will stick to buying what you need! Prior to going to the grocery store, take the time to surf the web (Pinterest), read recipe books or review your own recipe file to plan out your meals. This way you will know the ingredients that you will need before heading out to the store. Instead of mindlessly shopping and ending up with items that don’t serve you well, you will be mindful and aware of what you are buying. Supermarkets and manufacturers know how to market merchandise to consumers, especially hungry ones that shop without a plan! When you have a plan and create a list, you will be less vulnerable to give in to temptation as you go up and down the aisles. Make a commitment to stick to your list. When you take the time to make a shopping list from a meal plan that also includes snacks, you will be more likely to stay the course of your good intentions to eat well. Shop the perimeter of the store first. This is where you will typically find the fruits and veggies as well as the dairy, meat, chicken and fish departments. Within the inner aisles of the store you will mostly find packaged and processed foods. Limit your time here! Stop and ask yourself while shopping, would my grandparents or ancestors have had access to this food 100 plus years ago? Our ancestors did not have access to processed foods long ago. Consider eating whole, fresh, natural and unprocessed foods as much as possible... your body will LOVE you for it! Choose romaine, kale and spinach over iceberg lettuce. Buy sweet potatoes instead of white potatoes. Consume brown rice or wild rice instead of white rice. Choose more vibrant colored vegetables instead of the pale variety. Colorful vegetables are packed with more nutrients. Purchase whole grain bread or sprouted breads along with brown rice and whole wheat pasta as they contain more fiber. They also help to balance your blood sugar levels, which allow you to stay fuller longer. Do not put sugary drinks into your cart! Say goodbye to sodas, sports drinks, and fruit juices. These are liquid carbs and are made up of empty calories! They cause your blood sugar to rise significantly. Purchase sparkling water and cut up lemons and limes instead. You might consider purchasing a water infusion pitcher so you can add berries, watermelon, mint or even cucumber, among other combinations to flavor the water naturally. Check out the below Detox Water Bar picture for some really great water recipes to change things up a bit! Buy herbal and green teas and make pitchers of iced tea. There are some really great flavored green tea varieties out there! These are tasty alternatives to sweetened drinks! Try to avoid (if possible) drinks that contain artificial sweeteners like Crystal Light with aspartame. There are some varieties that are made with Stevia now that are a much healthier option. Just as you create a list and meal plan for your week, do the same with balanced healthy snacks. If you eat 5 or 6 smaller portioned meals or snacks each day, your blood sugar will be more stable and you’ll feel full longer. Eating healthy for the long-term is about balance. Cutting out foods indefinitely doesn’t work for every one. It’s okay to give in to some of our cravings. If we don’t, we may choose to binge or give up our lifestyle changes when we can’t be perfect. Be smart about your indulgences. If you love ice cream, don’t buy a pint of Ben and Jerry’s, buy the small overpriced mini-pint size and have that available to eat once or twice a week. Think about purchasing single ingredient foods. For example, broccoli and apples are single ingredient foods. Avoid processed foods that contain additives, preservatives, trans fats, etc. Adopt the rule: If you can’t pronounce it, don’t eat it! Attempt to stick with items that have 5 ingredients or less and limit foods that are in a box, bag or can. Just because the package says “low fat” or “low calorie” or “good source of” …. Does not mean that it is healthy! Last but not least..... What about the workouts? Can I really do them?? YES!! There is a modifier for every workout with the 21 Day Fix program and they are designed to be effective for any fitness level. You can go with the modifier and work your up as you gain strength and endurance. Autumn also shows you ways to amplify the move if you choose if you want to take it up a notch! So - you can really go at your own pace! Another beautiful thing about this program! But, the best thing about this program is that the workouts are only 30 mins long!! That's right! You CAN get a GREAT workout in only 30 minutes. I find it very hard to find time to exercise for an hour with my busy schedule, much less take time to drive to the gym! One of the things that I love about fitness at home is that most of the time I am exercising in the living room while dinner is baking in the oven or simmering on the stove! Multi-tasking at its finest! You busy moms know exactly what I am talking about! You do not need much space at all to complete the workouts. I have done all of them in my living room, which is quite small. You really only need about a 4 foot x 4 foot area to get it done! Also, she does incorporate light weights and a resistance band with the workouts. I would suggest either 3 pound or 5 pound dumbbells to start. (For 21 Day Fix Extreme, maybe an 8 - 10 pound set of dumbbells additionally). You will also need a resistance band. You can get both a resistance band and a set of dumbbells from Wal-Mart quite inexpensively. No problem! Here is a video that I made to explain the program that you might enjoy watching. Of course, please feel free to contact me via email or Messenger if you still have questions. I am happy to help and always available to answer questions or chat! Day #4 is Done!! I hope you found value in today's content! Tomorrow, we will talk about the value of a challenge group and I will answer frequently asked questions like coffee and wine intake, going out to eat, and traveling while on the 21 Day Fix. Stay tuned and I will see you tomorrow!